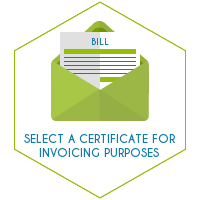 We propose numerous certificates that can be used to sign and/or timestamp invoices. However selecting a certificate can be tricky and numerous parameters have to be taken into account: do you wnat to send original invoices by electronic means, archive them or totally dematerialize your accounting documents? You'll find below a guide to the digital signature. ▲ Warning: the 'tax value' notion is only true for French organizations. Manual signature implies a limited quantity of documents to be signed. WHAT LEGAL VALUE FOR YOUR INVOICES? Do you want to send original invoices by electronic means or generate PDFs with a real tax value and get definitevely rid of paper invoices? Do you want to send original invoices by electronic means, generate PDFs with a real tax value and get definitevely rid of paper invoices or else digitize and archive invoices? The Adobe Acrobat Reader recognition doesn't bring anything from a legal standpoint but from a marketing one the recognition is a promise of seriousness and can reassure your customers. What volume of signatures are we talking about? A PDF signed and timestamped get a "tax value". Can be used to issue digital invoices. A PDF signed and timestamped get a "legal value". Can be used to digitally store invoices that have been issued or received in paper format. A signed PDF becomes an original document. Au unsigned PDF is a mere copy. The document is not an original.